Stampin' Up! announced that several of the stamp sets currently on the Dormant List will no longer be available after January 4, 2010. The Dormant List contains stamp sets that are not listed or pictured in the current Stampin' Up! catalog, but are available for purchase. All of these Dormant Stamps, except Easter Beauty and Bella Pascua, will be discontinued after January 4th, 2010. I am so sad to see several of these leave - remember, these sets are still available to order through a Stampin' Up! demonstrator or through the Online Ordering from Stampin' Up!, but only until January 4th, 2010. This versatile set creates gorgeous projects for every season. Here is a recent Halloween card I made using the Branch Out set. I featured this card on my blog a few months ago. It uses an Always Artichoke card base with Crushed Curry, Basic Black and Dusty Durango. I stamped several of the bird image from Branch Out in the tree branches - I've always found birds a little bit creepy. 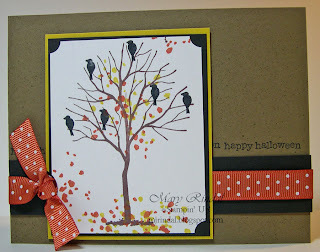 Here is another Autumn card using Branch Out and Dusty Durango. The leaves image was stamped repeatedly in the branches in Certainly Celery, Crushed Curry and Dusty Durango inks. This Winter card uses Branch Out with its snowflakes image and the bare tree. I stamped the tree in Basic Black Craft Ink and embossed it with Clear Embossing Powder. The snowflakes are stamped with Whisper White Craft Ink and embossed with White Embossing Powder. I used a Sponge Dauber to add some Lavender Lace ink around the edges of the main image. And this beautiful black and white paper is the soon-to-unavailable Night & Day Specialty DSP. Spring Branch Out - this card in soft pinks and blue uses a now retired Designer Series Paper. Glittery Butterfly Branch Out - this card also uses a now retired Designer Series Paper. Spring Swap Card - this card is my favorite card from 2009 - it also uses a now retired Designer Series Paper. To see some beautiful projects using another soon-to-be-retired stamp set, Classy and Fabulous, continue on the SA Retiring Dormant Blog Hop with Michelle Sturgeon at her Come Stamp With Me blog. I love how you used this set! I have it on order now...yippee!!!! I love the middle card the best - the effect of leaves on the tree and then fallen inside is FABULOUS! I love Branch Out (sniff, sniff). Wonderful samples! Tis set is so versatile. It can be used for everything from spring to Halloween. Bummer it's going to be retired. Great cards. Love how you do the insides too. And I did get a feeling of The Birds on the first one, but great for Halloween. Mary, your cards are beautiful! This set has been on my wishlist, and I just have to get it now! Such pretty cards Mary! I love your blue, black and white winter card! So creative and pretty! I love those crows in the first card, and that winter thank you is simple gorgeous! I've never been able to wrap my heart around this set, but you did some absolutely gorgeous cards with it. Love the black and white and the snowflake one especially. Great work. So bummed this set is retiring. Look at all the lovely things you did with it!!! Mary!! Wow!! Beautiful cards!! You did a fantastic job! My favorite was the last one. Great job!! I LOVE the first card! The colours are stunning. I will really miss this set.